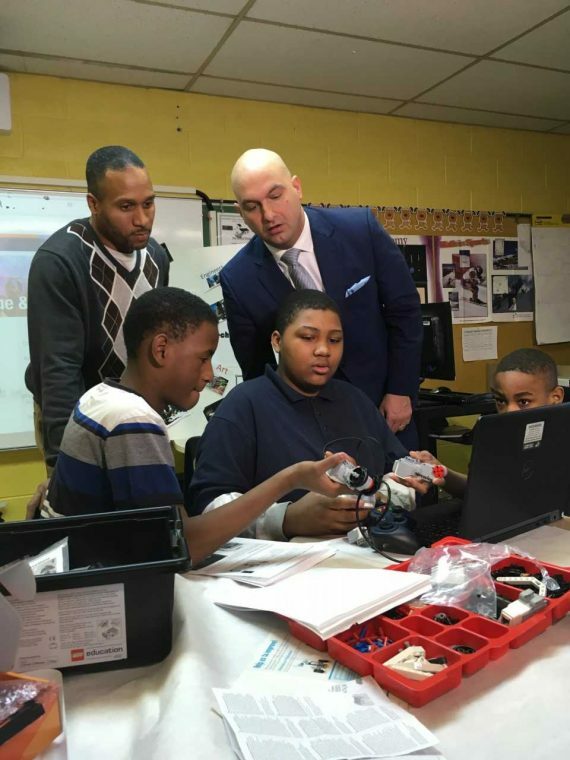 DETROIT – February 16, 2018 – More Detroit Public Schools Community District students and schools will be involved with inquiry-based and hands-on learning through the District’s expanded robotics club initiative funded by the FIRST (For Inspiration and Recognition of Science and Technology) Robotics Grant offered by the Michigan Department of Education. The $112,000 grant will help to pay for hands-on robotics kits and after school coaches to expand the District’s robotics clubs. This year the program has grown to 53 clubs, compared to 17 last year. This affords more students the opportunity to apply and acquire science and math skills to construct robots while developing additional skills such as: critical thinking, creativity, design, and problem solving with peers in groups. These skills will prepare students to compete in local and national competitions while also preparing them for the economy’s top jobs. Detroit will host the 2018 FIRST Robotics World Championships from April 25 – 28, 2018 at Cobo Center. The District is preparing to send 53 teams to the competitions, consisting of up to eight students per team. DPSCD is home to the award winning all-female robotics team at Detroit International Academy for Young Women, Cass Tech and Southeastern. For students ages 6-10 years. Guided by two or more adult Coaches, FIRST LEGO League teams research a real-world problem such as food safety, recycling, energy, etc., and are challenged to develop a solution. They also must design, build, program a robot using LEGO MINDSTORMS®, then compete on a table-top playing field. FIRST Tech Challenge teams are challenged to design, build, program, and operate robots to compete in a head-to-head challenge in an alliance format. FIRST Robotics Competition is the combination of excitement for sport with the rigors of science and technology. Guided by Coaches and Mentors, students develop STEM skills and practice engineering principles while realizing the value of hard work, innovation, and sharing ideas.